Purpose: The objective of this study is to analyze the relationship of fatigue and pain between mobility aid usage and depressive symptomatology in ambulatory individuals with spinal cord injury (SCI). Materials and Methods: The data was collected from 200 ambulatory individuals with spinal cord injury. Numerical rating scale was used to evaluate the intensity of pain. The Fatigue Severity Scale (FSS) score was applied to evaluate fatigue. For assessment of depressive symptomatology hospital anxiety and depression Scale (HADS) was utilized. Mobility aid usage was informed by individuals personally. Results: Depressive symptomatology indications were shown by sixty three percent (63%) of individuals with moderate to severe levels of depression. About fifty two percent (52% at 95% CI) of the patients have moderate to severe fatigue symptoms which impede with normal function. Extreme pain intensity was measured in 20.5% whereas moderate intensity of pain was measured in 31% of the patients. Several mobility aid devices like wheel chairs, orthoses, canes, crutches and walkers were utilized by the SCI individuals. Near about 5% of the individuals need other people assistance for ambulation. Conclusion: The correlation among mobility aid devices and depressive symptoms is interceded by pain and fatigue. Depressive symptomatology is more prominent in individuals using other people assistance for ambulatory services. SCI (spinal cord injury), Fatigue, Depressive symptomatology, Mobility aid, Ambulatory individual. Spinal cord injuries have been categorized as incomplete or less rigorous and complete or more severe. The patients with incomplete Spinal Cord Injury (SCI) maintain comparatively improved results with the persons having complete lacerations at the same spinal point. However, incomplete SCI individuals have to tolerate obstructions including both social and medical. Certain factors are correlated with the level of neurological maintenance or improvement including extent of physical sovereignty attained, span of hospital stay, expenditures of services provided and yet endurance itself . The assistance of particular body damages and motion restrictions to walking disability after incomplete SCI has argumented. It was notified in the early studies that more standing conception manipulates everyday activity disapprovingly [2,3]. Some further researches specified that inferior-edge potency is the considerable elicitor of self-sufficient ambulatory activity [4,5]. Particularly, extensor and flexor muscles of knee and hip respectively are major elements of walking activity of speed and of flourishing regain of society ambulatory activity . Additional studies provide significant proof designating that depressive symptomatology results in problems associated with physical condition and performance [7-14]. All of these previous analysis studies provide information which is in accordance with the fact that physical restraints boost up the hazard of depressive symptoms and vice versa . Pain, fatigue and depressive symptomatology have been related to physical immobility in grown-up population with severe problems. It is commonly observed that fatigue is a common source of problem in individuals suffering from SCI. The previous research studies reported that 25% of the patients having delayed effects of SCI accounted for fatigue intensity which influences their normal life. There is a strong correlation of SCI with various other symptoms that might result in depression, fatigue, anaemia and persistent pain . The main objective of this study is to find any relationship of fatigue and pain between mobility aid usage and depressive symptomatology in ambulatory individuals with SCI. the longlasting effects of SCI includes pain, fatigue and depression which is greatly influenced by mobility aid devices. This study was conducted in China and the objective of this study was to analyze the relationship of fatigue and pain between mobility aid usage and depressive symptomatology in ambulatory individuals with SCI. For this study we collect samples from different hospitals and trauma centers of China. For this study total 200 patients were selected from different hospitals of China. This study protocol was approved by the Institutional Ethics Committee of Jining First People’s Hospital Jining City (approval No. IEC/098/000975), and undertaken according to the ethical standards of the World Medical Association Declaration of Helsinki. About 200 patients (male/female) were examined after SCI treatment. For this reason trauma centers and hospitals were visited and patients were examined who went through SCI surgeries. The relationship of fatigue and pain between mobility aid usage and depressive symptomatology in ambulatory individuals were measured. 135 male and 65 females with SCI were selected for this study within 18 to 40 years of age. • Patients having SCI for more than a year. • Patients with lasting effects of SCI. • Females and males between 18 to 40 years of age. • Patients showing interest to visit hospital on various recall visits. • Patients agreeing with the particular informed consent. For assessment of depressive symptomatology, various measurement scales were utilized. In our study for measurement of depression, patient health hospital anxiety and depression scale (HADS) was utilized. The HADS were planned exclusively for immuno compromised individuals to perceive indications of depression and anxiety. HADS Performa was given to SCI patients in our study and also helped out to fill up the form if further assistance is required. HADS questionnaire form contains 14 proclamations (e.g 7 for anxiety and 7 for depression) appropriate to general anxiety and depression symptomatology. The scores varying from zero to 3 limit having 4 probable responses for each entry with highest score of 21 for each entry. The entire HADS score was also computed showing highest or lowest anxiety and depression symptomatology. For measurement of fatigue in SCI individuals, fatigue severity scale (FSS) was utilized. Patients were involved in filling up the FSS form. Fatigue was measured by the help of nine-point FSS, which evaluates the effect of fatigue on various components of everyday life. For calculating fatigue a scale of seven-points varying from point one disagree to point seven agree was used. FSS mean score was computed by the addition of all the points. FSS mean score greater than four has been designated as higher or severe fatigue . For the assessment of pain in SCI individuals various scales were utilized. In our study we used Numerical Rating Scale (NRS) for pain assessment in SCI individuals. 200 patients were analyzed for pain by the use of NRS. NRS engages SCI patients to rate the strength of their pain by deciding a number on a scale from 0-10 on an 11-point scale, by starting orally a numerical rank. The number 0 indicates no pain, whereas numbers from 1 to 3 on scale indicates mild pain. From 4 to 5 numbers, moderate pain intensity was considered and from 6 to 10 severe or extreme pain intensity is considered. A questionnaire was proposed to recognize ambulatory grade, ambulation appliances, additional support and highest expanse of walking. Ambulation grade was calculated by a simple query: “Are you capable of walking?” with answers in yes or no status. The individuals who answered yes were included in the study. Patients were asked about the ambulation appliances they utilized. Multiple ambulatory devices were considered in this study and patients were asked for the usage of specific devices. If the answer is Yes than it was given point 1, whereas No was denoted by 0. Wheel chairs: Manual wheel chairs are designed to provide mobility from a seated position. Manual wheel chairs were usually utilized for patients with SCI. Participants were asked whether they used wheel chairs or not. On the basis of their answers 0 or 1 results were recorded. Canes: Canes are easily accessible in various lengths, modes, shades, and stuffs and available with various hold alternatives. SCI patients used both single-point cane and quad cane for ambulation. Data was recorded with 0 or 1 answer. Orthoses: Orthoses (braces) are readily available in many types and styles and an ankle foot orthoses (AFO) is the brace most frequently utilized by SCI patients. On the basis of the answers recorded by individuals 0 or 1 results were recorded. Walkers: Walkers have a broad base area for hold in contrast with canes and orthoses. Walkers are available in two fundamental categories, e.g, Standard walker and Rollator. The standard walker has a central frame made up of aluminum which folds up and is accessible including or excluding wheels. On the other hand, rollator is devised for the easy movement as compare to standard walker and is available with wheels. SCI individuals utilized both types of walkers. On the basis of the answers recorded by individuals 0 or 1 results were recorded. Crutches: Two types of crutches are available (Underarm and Forearm). Underarm crutches are mostly utilized on a transitory basis for lower extremity injuries whereas forearm crutches are more frequently utilized for extensive period of time because of its comfort designing and handgrips for hold. SCI individuals utilized both types of crutches. On the basis of the answers recorded by individuals 0 or 1 results were recorded. Participants were also inquired whether they utilized assistance of other persons for walking or not. Highest walking expanse was judged by means of Walking Index for Spinal Cord Injury (WISCI) criteria. The data was recorded for the total number of mobility aids usage on the addition of the following: wheel chairs (0, 1), canes (0, 1), orthoses (0, 1), walkers (0, 1) and crutches (0, 1). For statistical analysis students t tests and Chi-square test was utilized initially. Variables were determined by their P-values. SPSS version IBM was used for all analysis. Multivariate regression analysis was performed to find out the relationship. For the analysis of depressive symptomatology in SCI individuals multiple scales were utilized. In our study HADS was utilized. The mean score of anxiety was considerably different between male and female participants of SCI. The mean anxiety score in males was 6.23 ± 5.16; whereas mean anxiety score in females was 9.29 ± 6.57; (p>0.005). The mean depression score was also significantly dissimilar between male and female individuals of SCI. The mean score of depression in males was 5.41 ± 4.32; in males and 7.36 ± 4.54; in females (p>0.005). The percentage of the participants with mild anxiety was 41.5%, whereas moderate anxiety has percentage of 48% and patients with severe anxiety were only 10.5% in our study group. According to depression scale measurements, 37% participants have mild depression, 46% have moderate depression and 17% have severe depression symptoms. Pain intensity in SCI individuals was calculated by using numerical rating scale (NRS) of pain. The mean score of pain intensity in males was 3.32 ± 2.12; whereas mean pain intensity score in females was 3.96 ± 2.75; (p>0.005). Pain intensity was categorized in four scales e.g, no pain, mild pain, moderate pain and severe pain. The number 0 indicates no pain, whereas numbers from 1 to 3 on scale indicates mild pain. From 4 to 5 numbers, moderate pain intensity was considered and from 6 to 10 severe or extreme pain intensity is considered. The percentage of participants with no pain was 5.5%, with mild pain 43%, with moderate pain 31% and patients with severe pain were 20.5%. The comparison analysis of pain, anxiety and depression has been recorded (Figure 1). Analysis of fatigue was performed by using FSS. For calculating fatigue a scale of seven-points varying from point one disagree to point seven agree was used. FSS mean score was computed by the addition of all the points. The mean score of fatigue intensity in males was 7.92 ± 5.12; whereas mean pain intensity score in females was 8.13 ± 5.93; (p>0.005). The percentage of participants with no fatigue was 7%, with mild fatigue 41%, with moderate fatigue 44.5% and patients with severe fatigue were 7.5%. Pain and fatigue intensities were calculated and analyzed (Figure 2) and pain, fatigue and depressive symptoms were also compared (Figure 3). 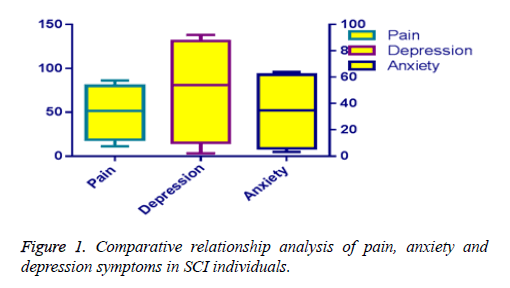 Figure 1: Comparative relationship analysis of pain, anxiety and depression symptoms in SCI individuals. 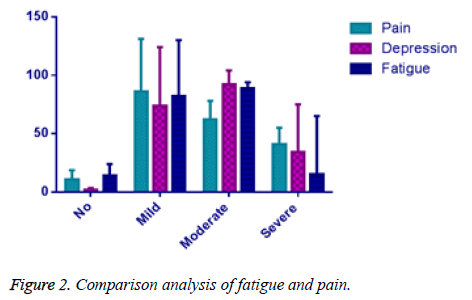 Figure 2: Comparison analysis of fatigue and pain. Figure 3: Comparative relationship analysis of pain, fatigue and depressive symptomatology in individuals with SCI. Figure 4: Percentages of mobility aid devices utilized by SCI individuals. Various mobility aids were utilized for ambulatory purposes in SCI individuals. Multiple ambulatory devices were considered in this study and patients were asked for the usage of specific devices (Figure 4). If the answer is Yes than it was given point 1, whereas No was denoted by 0. The percentage of individuals with wheel chairs usage was 24.5% whereas canes were utilized by 32.5% of the participants (Figure 5). Almost 10.5% of individuals used orthoses or braces for ambulation and walkers were utilized by 9.5% of patients. Crutches were used by 18% of the patients and only 5% of the individuals used assistance from other people (Table 1). The chi-square analysis revealed that there was a significant difference measured among the number of various mobility aid devices utilized and depressive symptomatology (P-value=0.0005). In case of usage of wheel chairs the P-value=0.0173, whereas canes usage have P-value=0.0318. Orthoses have P-value=0.0774, walkers having P-value=0.0295 and crutches usage have Pvalue= 0.0931. The P-value for other people assistance was equal to P-value=0.0073. Significant dissimilarity have been scrutinized between the pain intensity and fatigue analysis e.g, P-value=0.0002 (Table 2). 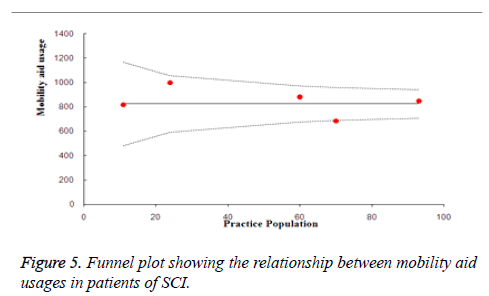 Figure 5: Funnel plot showing the relationship between mobility aid usages in patients of SCI. Table 1. Percentages of mobility aid devices utilized by SCI individuals. Table 2. Multivariate relationship analysis of HADS score with mobility aid devices. The multivariate regression analysis disclosed that the odd ratios for the individuals using wheel chairs as mobility aid were lesser as compare to other sources of mobility. The odd ratios for the individuals using wheel chairs at 95% CI were 0.461 (0.21-0.84). The comparison analysis revealed that the individuals using other people support for mobility accounted much more depressive symptoms as compare with those who did not. The odd ratios for individuals having other people support at 95% CI were 2.32 (0.81-5.47). Another analysis showed that extreme intensity of pain augmented ratios for depressive symptomatology. In individuals with severe intensity of pain the odd ratios at 95% CI were 4.13 (2.52-9.28). Severe pain intensity would also result in significant increase of fatigue with odd ratios at 95% CI were 6.32 (2.87-14.07). Association analysis among other people assistance and usage of wheel chairs and depressive symptoms provide significant difference (Table 3). Table 3. Multivariate regression analysis for various variables at 95% CI. The main purpose of this study is to find relationship of fatigue and pain between mobility aid usage and depressive symptomatology in ambulatory individuals with SCI. Most of the patients utilized at least one mobility device for ambulation. Our study results revealed that continuing ambulatory activity would result into many health effective issues. Our study results were consistent with the previous study of Gerhart et al. which states that about 80% of the patients with SCI accounted lasting issues in any field and initial revitalization does not guarantee any long-lasting concerns. Fatigue analysis was performed by FSS, starting from no fatigue to severe fatigue. Out of 200 individuals 7% have no fatigue symptoms, 41% have mild fatigue, 44.5% have moderate symptoms of fatigue and 7.5% have severe symptoms of fatigue. These results strongly supports that SCI individuals have correlation with fatigue. Our study results were consistent with previous study of Anton et al. 2008  which revealed that, medical practice recommends fatigue as one of the major issues with lasting effects in patients with SCI. HADS was utilized for analyzing the anxiety and depression ratios in individuals with SCI. Depression and anxiety was calculated from mild to severe symptoms. Our study confirms that depression and anxiety affects patients with SCI. Our results showed significant similarity with the previous study of Bayat et al. which indicates that individuals suffering from persistent sickness like SCI would suffer elevated intensities of anxiety and depression as compare with healthy persons. Pain intensity in SCI individuals was calculated by NRS from 0 to 10 points. The 0 point indicates no pain and 10 point indicates severe pain symptoms. 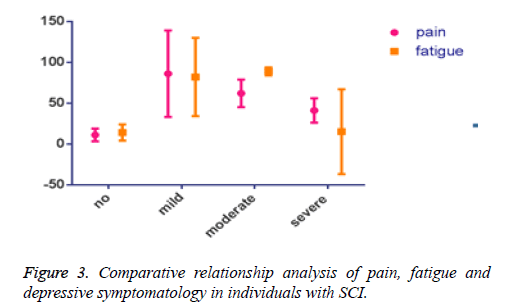 Most of the patients of SCI in our study group suffered from mild to moderate pain (74%). Thus, our results confirmed that most of the SCI individuals have high pain intensities with lasting effects. Our study results were consistent with previous study of Tan et al. which reported that extreme pain intensities after SCI are a frequent predicament that intensely influences the eminence of living. Our study individuals utilized various types of mobility aids for ambulatory purpose. Very few people with SCI move without any mobility device. Most of the people utilized wheel chairs, canes, orthoses, walkers and crutches as mobility devices. Nearly 5% of the patients require other people support or help for moving. Saunders et al. reported that individuals with SCI lacking the basic method of mobility or ambulation are at enhanced threat for falling issues. This statement is consistent with our study results which revealed the enhanced usage of mobility aid devices by SCI individuals. Our study also indicates the relationship between various mobility devices usage and the depressive symptoms. The persons having assistance of other people for moving suffers from depression at a greater rate than others. It is also shown that severe pain intensity would also result in increased depression symptoms with influence of fatigue. Our study results were consistent with a previous study of Dipiro et al. which stated that other people assistance for ambulatory purposes following SCI is correlated with highest odd ratios of depression symptoms. These associations interceded by high pain concentration and fatigue intensity. Our study results have few limitations including that our data was reported by individuals personally about the usage of mobility aids or any other variable. Somewhat different results were found from the data recorded in hospitals. Secondly, our study analysis was unable to distinguish several considerable self-sufficient outcomes due to the small size of the sample. This study basically emphasize on the points that are most interconnected with each other. Moreover, individuals for this study were chosen from some selected hospital and those hospitals mostly confines SCI patients inside that localized area so there would not be significant difference detected among samples. Finally our study data was cross-sectional and hence, assessment and estimation of alterations was unachievable. By the results and discussion it is further concluded that other people support for mobility subsequent to SCI results in higher depressive symptomatology which is further influenced by higher intensity pain and higher fatigue level. The relationship among pain intensity and fatigue and depressive symptoms in SCI individuals is greatly influenced by the mobility aid devices and usage. Funding support: Shandong province natural science foundation of China (No: ZR2009CL027); Star of Jinan city technology bureau of science and technology plan (20100118). Gerhart KA, Johnson RL, Whiteneck GG. Health and psychosocial issues of individuals with incomplete and resolving spinal cord injuries. Paraplegia 1992; 30: 282-287. Adams MM, Hicks AL. Spasticity after spinal cord injury. Spinal Cord 2005; 43: 577-586. Scivoletto G,Romanelli A,Mariotti A,Marinucci D,Tamburella F,Mammone A,Cosentino E,Sterzi S,Molinari M. Clinical factors that affect walking level and performance in chronic spinal cord lesion patients. Spine 2008; 33: 259-264. Kim CM, Eng JJ, Whittaker MW. Level walking and ambulatory capacity in persons with incomplete spinal cord injury: relationship with muscle strength. Spinal Cord 2004; 42: 156-162. Waters RL, Adkins RH, Yakura JS, Sie I. Motor and sensory recovery following in-complete paraplegia. Arch Phys Med Rehabil 1994; 75: 67-72. Saraf P, Miriam RR, Jennifer LM, Jennifer HK, Kathryn H, Kristan L, George H. Daily Stepping in Individuals with Motor Incomplete Spinal Cord Injury. PhysTher 2010; 90: 224-235. Dunlop DD, Manheim LM, Song J, Lyons JS, Chang RW. Incidence of disability among preretirement adults: The impact of depression. Am J Public Health 2005; 95: 2005. Lenze EJ,Schulz R,Martire LM,Zdaniuk B,Glass T,Kop WJ,Jackson SA,Reynolds CF 3rd. The course of functional decline in older people with persistently elevated depressive symptoms: Longitudinal findings from the Cardiovascular Health Study. J Am GeriatrSoc 2005; 53: 569-575. Jiang J, Tang Z, Futatsuka M, Zhang K. Exploring the influence of depressive symptoms on physical disability: A cohort study of elderly in Beijing, China. Qual Life Res 2004; 13: 1337-1346. Cronin-Stubbs D,de Leon CF,Beckett LA,Field TS,Glynn RJ,Evans DA. Six-year effect of depressive symptoms on the course of physical disability in community-living older adults. Arc Intern Med 2000; 160: 3074-3080. Penninx BW,Deeg DJ,van Eijk JT,Beekman AT,Guralnik JM. Changes in depression and physical decline in older adults: A longitudinal perspective. J Affect Disord 2000; 61: 1-12. Armenian HK,Pratt LA,Gallo J,Eaton WW. Psychopathology as a predictor of disability: A population-based follow-up study in Baltimore, Maryland. Am J Epidemiol 1998; 148: 269-275. Bruce ML,Seeman TE,Merrill SS,Blazer DG. The impact of depressive symptomatology on physical disability: MacArthur Studies of Successful Aging. Am J Public Health 1994; 84: 1796-1799. Gayman MD,Turner RJ,Cui M. Physical Limitations and Depressive Symptoms: Exploring the Nature of the Association. J Gerontol B PsycholSciSocSci 2008; 63: 219-228. Fawkes-Kirby TM, Wheeler MA, Anton HA, Miller WC, Townson AF, Weeks CA. Clinical correlates of fatigue in spinal cord injury. Spinal Cord 2008; 46: 21-25. Anton HA,Miller WC,Townson AF. Measuring Fatigue in Persons with Spinal Cord Injury. Arch Phys Med Rehabil 2008; 89: 538-542. Bayat N, Alishiri GH, Salimzadeh A, Izadi M, Saleh DK, Lankarani MM, Assari S. Symptoms of anxiety and depression: A comparison among patients with different chronic conditions. J Res Med Sci 2011; 16: 1441-1447. Tan G, Rintala DH, Jensen MP, Richards JS, Holmes SA, Parachuri R, Lashgari-Saegh S, Price LR. Efficacy of cranial electrotherapy stimulation for neuropathic pain following spinal cord injury: a multi-site randomized controlled trial with a secondary 6-month open-label phase. J Spinal Cord Med 2011; 34: 285-296. Saunders LL, Dipiro ND, Krause JS, Brotherton S, Kraft S. Risk of Fall-Related Injuries among Ambulatory Participants with Spinal Cord Injury. Top Spinal Cord InjRehabil 2013; 19: 259-266. Dipiro ND,Saunders LL,Brotherton S,Kraft S,Krause JS. Pain and fatigue as mediators of the relationship between mobility aid usage and depressive symptomatology in ambulatory individuals with SCI. Spinal Cord 2014; 52: 316-321.